To redevelop the old brownfield site at The Old Brewery in Mansfield with 75 new family homes. £4m development at Fernwood School, Nottingham, including new classrooms, an assembly hall and changing rooms. Works have now officially begun on the first Wise Living development, ‘The Old Brewery’ in Mansfield. The development has the backing of Mansfield District Council, who helped to bring forward plans in order to redevelop the brownfield site. The site will include 75 family homes available for rent, ranging from one to four bedrooms have been named after famous icons from around the area – with three-bed homes named ‘Byron’ (Lord Byron – poet resided at Nottinghamshire’s Newstead Abbey), the two-bed ‘Lawrence’ (D.H. Lawrence – writer and poet from Eastwood) and the four-bed ‘Nightingale’ (Florence Nightingale – founder of modern nursing who had strong ties with Derbyshire village, Holloway). The Wise Living scheme aims to revolutionise the private rental sector by challenging existing standards, creating and nurturing communities and, ultimately, driving better living standards for tenants. Mansfield District Council has been keen to see the derelict site of the old Mansfield Brewery redeveloped. And with our help, the area will be provided with much needed, good quality rented housing. We’re pleased to be part of helping to regenerate an area of Mansfield which has been derelict for over 15 years! Works have also begun Fernwood School in Nottingham. The works include new classrooms, an assembly hall and changing rooms which are being created as part of the £4m development, due to be completed in the winter 2019/20. The old buildings at the school have now been demolished including an old hall and gym allowing work to start the reconfiguration of the existing block as well as improvements to the site. The Ofsted Outstanding-rated school is extremely popular and hugely over-subscribed. There is a clear need for additional secondary capacity in Wollaton, and Fernwood is committed to providing more places for its feeder schools and the local community. The overall intake at the secondary school, in Goodwood Road, will increase from 1,055 to 1,500 when all year groups are full – enabling 445 more pupils to access the popular school within the next few years. Fernwood Headteacher Paul Burke said: “I’m thrilled that work to expand our school is now underway. In recent years, there have been children in our catchment area who have not been able to secure a place at Fernwood. With this expansion, we shouldn’t have any more disappointed families. 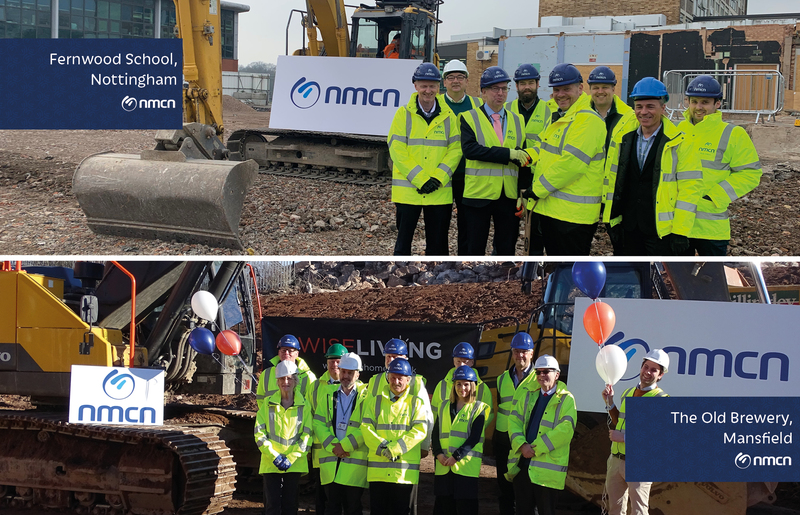 Nick Banks, Operations Director commented “This is a fantastic project for nmcn to be involved in, we are delighted to be working on this education scheme in the heart of Nottingham. We are working with CBP Architects and GNA Surveyors are managing the expansion project. Work on both schemes will bring real value to the local communities and we look forward to playing our part.